"I slept and dreamed that life is all joy. I woke and saw that life is all service. Authentic Yoga challenges one's assumptions about the world and about oneself; it affects one's life in broad ways beyond the yoga mat! In her classes, Maretta hopes for students to find freedom to move toward wholeness and wellbeing, on all levels. She aims to facilitate the student’s experience of the body/mind in the present as one maintains steady awareness of the breath. Thus, with each breath consciously taken, one aligns with Spirit: that which is creative, joyful and sustaining of all beings in the natural world. Maretta loves connecting with students and sharing TriYoga's insights, though still feels like a novice to the amazing depth of TriYoga practices. Since 2005, her classes have been held in a beautifully-renovated home studio, which holds about eight students. Small classes encourage focused individual attention and friendly community. Classes are offered according to seva (service for the benefit of others, the essence of karma yoga). Maretta has studied TriYoga® since 1999. She is certified in Basics, Level 1 and Level 2. 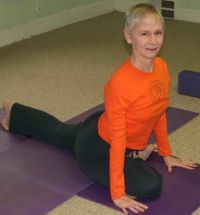 She has completed over 1,100 hours of TriYoga training workshops, courses and practicums--including Physical Anatomy, Subtle Anatomy, TY Teaching Methodology & Practicums, TY Prana Vidya (pranayama & meditation practices), TY Mudra, Yoga Philosophy (jnana), Yoga Sutras, beginning Sanskrit, Partner Yoga, TriYoga for Pregnancy, Vegan Cooking & Yoga Lifestyle. She has also successfully mentored several students in the certification process of TriYoga Basics and is currently an intern in both TY Level 3 and TY Prana Vidya. 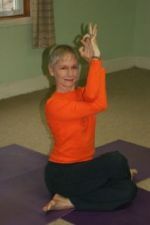 Maretta is qualified as E-RYT 500 with Yoga Alliance, and as of March 28, 2019, has taught more than 5,500 logged hours of group and private classes. 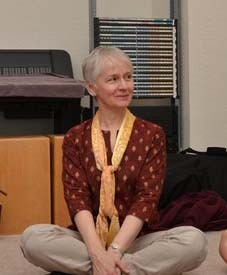 (In addition, she has extensive alignment experience in Iyengar yoga, attending regular classes since 2000). Maretta especially admires master yogini and TriYoga® founder Kali Ray (Kaliji) for her generosity, joy and dedication to sharing TriYoga. She appreciates TriYoga's unique systematic approach that focuses on spinal flows and alignment and allows students to progress gently and safely. As students grow in physical capacity, their knowledge of transformative mental and spiritual energies increases as well. For more information, see https://www.yogauonline.com/therapists/maretta-jeuland. Long before experiencing yoga, Maretta worked "au pair" in France, so speaks rather fluent French. She earned an M.S. in both child psychology and in linguistics plus elementary school teaching certification. She taught English as a Second Language (ESL) to adults on Chicago's South Side. Supporting her family, she volunteered in public schools 1) tutoring non-English speakers, 2) writing grant proposals that established a State Board of Education-funded French language program in the elementary school; 3) creating successful proposals that brought drug education and tutoring programs to the high school. She also coordinated a peer tutoring program and developed a website for the high school. Finally, she volunteered for 15 years to help rejuvenate the high school's alumni association. Maretta enjoys music and dance; walking near water and in forests; full moons; reading. She is an avid traveler, having made many trips with husband Abel to France, Poland and other countries in Europe, plus Tunisia, Singapore, Mali, Turkey, Peru and India. "There is nothing like experiencing a foreign culture to change one's habitual tendency to cling to a single, insular view of the world--and to challenge and refresh one's beliefs about what's 'true'!" "When you inhale, you are taking in the strength from God.